As the name already suggest it, Jungle Games is an online video slot with a theme inspired by the wild animal life. The game is a 5-reels and 20 paylines video slot created by Net Entertainment software developer. The action tooks place in the hot savannah of Africa. All the animals are preparing to participate in the biggest sporting event and each animal is set up for a different sport. 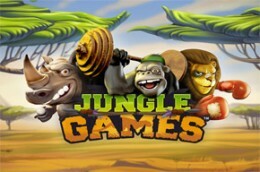 Jungle Games offers to its players 3D graphics, wild and scatter symbols and free spins. The symbols are sport-related and they include whistle, barbells, goggles and a towel, a basketball, a table tennis bat and ball and boxing gloves. In the same time, you will encounter animals as symbols: a giraffe, a gorilla, a hippo, a rhino and a lion. The game is playable on Windows, Mac, and Linux operating systems. The wild is a gold trophy and the scatter is a gold medal. The maximum win is 200.000 credits.